Indian police have killed five gunmen who attacked a flashpoint religious site in the northern city of Ayodhya. A sixth man is thought to have died triggering the blast which began the raid. A two-hour gunfight raged at the complex, claimed by Hindus and Muslims. Religious sites across India are on high alert following the attack, and the government has appealed for calm. No group has so far claimed the attack. In 1992, Hindu nationalists tore down a mosque at the site, sparking riots. The unidentified gunmen forced their way into the heavily guarded site in Uttar Pradesh state at about 0915 local time (0415 GMT). They used a jeep loaded with explosives to blow a hole in the wall of the complex, and drove a car through the gap. The gunmen were surrounded by armed police as they tried to enter the inner area of the complex. Three members of the security forces were injured. The inner area contains a tent with a temporary Hindu temple attended by Hindu priests and pilgrims. "All the attackers were wearing black trousers and shirts which made them look like commandos," one local man told Reuters news agency. Television pictures showed the charred jeep, with bodies and body parts littered around. A local official told the BBC that all the Hindu pilgrims and the religious structure were safe. The driver of the men's vehicle has been arrested and is being questioned by police, who say they recovered three AK-47 assault rifles and hand grenades at the site. 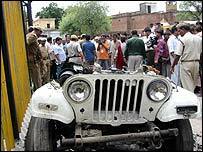 Prime Minister Manmohan Singh said it was fortunate that "the attack was foiled and the attackers were killed". Hindu leaders reacted angrily to the shooting. India's main opposition Hindu nationalist Bharatiya Janata Party (BJP) called for country-wide protests, accusing the government of going soft on terrorism. Party chief Lal Krishna Advani said the attack had brought the movement to build a Hindu temple at the site back to centre-stage. Hindu nationalist group the Rashtriya Shyamsevak Sangh (RSS) appealed to the public to keep any protests peaceful. Other Hindu nationalists blamed Pakistan, which swiftly condemned the attack saying it was "against terrorism in all its forms". In India, a prominent Islamic scholar, also urged calm. "No movement can succeed with violence," Maulana Wahiuddin said. The Ayodhya complex is one of the most fiercely disputed religious sites in the world, and one of the most heavily-guarded places in India. The complex is claimed by right-wing Hindus, who believe it is the birthplace of Lord Ram. The 16th century Babri mosque was destroyed 13 years ago by activists who believed it had been built upon an old Hindu temple. The move prompted one of India's worst bouts of nationwide religious rioting between Hindus and the country's Muslim minority, which left more than 2,000 people dead. The bloodshed was viewed as the most serious threat to India's secular identity since independence in 1947. The dispute over the complex is still working its way through India's courts.